Choosing to stay hotel “DIVS” You can be sure that it is a modern hotel with high standards of service, where you are willing to offer a decent stay at affordable price. Attentive staff will greet you at home warm and welcoming! We are happy to do everything to make your stay as comfortable as possible. Conference – hallConference Hall is not only to place your partners, but also to successfully conduct business negotiations, seminars, workshops, exhibitions and presentations. 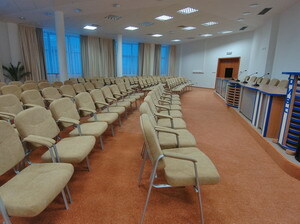 This modern conference hall accommodating the 120 people. We offer all the necessary presentation equipment : multimedia projector, portable screen, the Internet and the translation into four languages. You may order catering service for coffee breaks, business-lunches and an official buffet. We are pleased to offer a varied menu to suit your wishes. You may find fax or copier in a hall, and use wi-fi in rooms. All rooms are equipped with telephones, with domestic long distance and international calls . 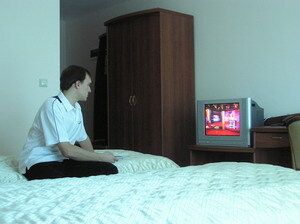 Your TV is set to broadcast local and Russian TV channels. daily maid service, once every three days, bed linen and towels is provided in our hotel. You may ask administrator for a hairdryer, tea making, iron and ironing board. If you need to wake you up , call the manager on duty to the extension 764 (720). To get the first aid contact the administrator by number 720 for a first aid kit or by short number 112 at city calling. Administrator can book a taxi for you at any time convenient . You can order a banquet, buffet, coffee break .